Manor house with stunning views and pool between Florence and Arezzo. Chateau / Country House409 sq. ft.
Small farmhouse, renovated with pool. Posted in setting of rare beauty, situated atop a hill in the Upper Valdarno, between Florence and Arezzo, it enjoys a stunning view of the Chianti Hills. Completely independent, with a beautiful front lawn, and a romantic pergola, it is part of an ancient farming settlement, completely restored, which comprises two independent houses. Good base to visit the most famous tourist destinations in Tuscany and Central Italy, strategically located for lovers of good food and good wine. Several good restaurants nearby and wineries. In summer there are outdoor festivals in ancient villages using local products. The house consists of a very panoramic bedroom, a kitchen, and a small bathroom and an outdoor area very impressive with pergola for eating and relaxing. For sports lovers point out the many riding schools in the area, the Golf Ugolino in Florence, tennis courts in Loro Ciuffenna, the Equestrian Center of Arezzo, and of greater relaxation of the thermal baths of Rapolano and walking activities in the cool woods the nearby Casentino. The taste of tradition is easy to switch to the Italian taste for fashion: many outlets nearby and the direct sale of Prada factory 15 km away. Small bathroom with window, shower and toilet. Located between Florence and Arezzo and can be reached by car: motorway A1 exit "Valdarno"; by train: Florence or Arezzo railway station, or Montevarchi; by plane: nearest airports: Bologna, Pisa, Rome. Located in the heart of Tuscany, it is only 40 km from Florence, 45 from Siena and 20 from Arezzo. Easily accessible all the smaller centers of Tuscany and Umbria of extraordinary artistic interest such as Anghiari, Pienza, Cortona, Assisi, San Gimignano ... It also offers scenic itineraries (from the banks of the Arno to Casentino) and food and wine thanks to the cellars and restaurants around. For fashion lovers, we suggest nearby the Prada store and the outlets of Incisa and Valdichiana. The Rapolano thermal baths can be reached in half an hour. 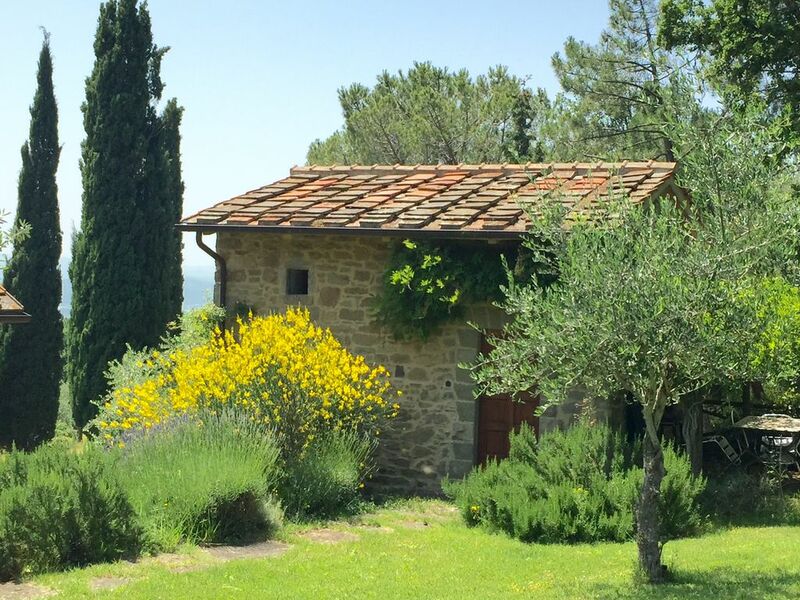 Located in the heart of Tuscany in a protected reserve offers the possibility of a relaxing holiday enjoying an extraordinary view of the Chianti hills just minutes from history, beauty and culture. For sport lovers there are numerous riding stables in the surrounding area that offer lovers of all levels, from simple lessons to walks in the surrounding woods. In the summer there are numerous initiatives related to the tradition of the place: dinners in the streets along the historic villages, visits to the cellars, guided tours in the cool woods of the nearby Pratomagno. In the nearby village of Loro Ciuffenna bikes are rented and bike rides organized to enjoy the marvelous territory in a direct and immediate way. The coasts of Tuscany can be reached in just one hour by car. Also remember that the first Sunday of each month in the historic center of Arezzo is held the most famous Antiquarian Fair in Italy.